Panelists at the AFM’s “International Awakening: Investing in Gender Diversity for Expanding Audiences Around the Globe” session (l-r) Jonathan King of Participant Media, producer Janet Yang, and Cornerstone Films’ Alison Thompson. Pictured (l-r) are participants in the Engage symposium: Suzanne Farwell, Chay Carter, Marlon Young, Effie Brown, Obba Babatunde, Kim Coles, Joi Carr, Cedric "The Entertainer," Shanta Wilson and Mignon Von. 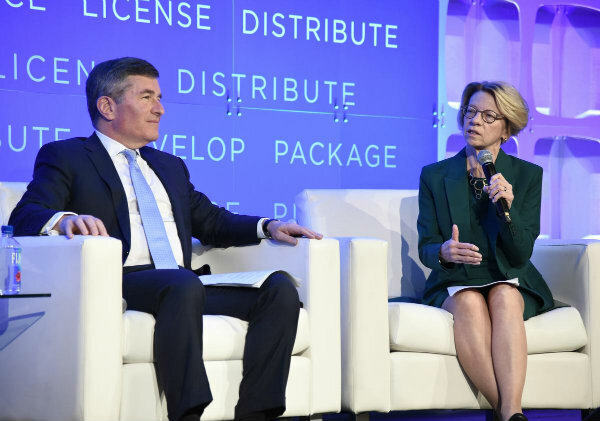 Motion Picture Association of America president Charles H. Rivkin (l) and Independent Film & Television Alliance president & CEO Jean Prewitt were featured speakers at the AFM's "The Global Perspective--View from the Top" presentation on Friday, Nov. 2. Amidst a week-plus of wheeling and dealing on completed features as well as projects in various stages of development, the 2018 American Film Market (AFM)--which wraps today (11/7) in Santa Monica--delivered much more in its distribution pipeline than just content for theaters and digital platforms. Also being distributed at AFM was advice on how to promote diversity and inclusion within that content and throughout the industry as a whole--along with insights as to why it’s important to bring ethnic minority and female perspectives to the fore. Among the AFM conversations delving into diversity and inclusion was an Engage symposium presented by Pepperdine University’s Institute for Entertainment, Media and Culture (IEMC) on Friday (11/2). The afternoon of Engage sessions included a panel on “21st Century Creatives and Storytelling” featuring a trio of noted female producers: Effie Brown of Duly Noted Inc. whose credits include Real Women Have Curves, and Dear White People; Chay Carter Of Little Bricks Entertainment who’s served as an exec producer on Best Picture Oscar winner Argo, and producer on such films as Live by Night and Serve Like A Girl; and Suzanne Farwell of Resonate Entertainment, known for her work in years past with director Nancy Meyers (It’s Complicated, Something’s Gotta Give, The Intern). The AFM discussion session was moderated by actor/comedian/author Kim Coles (Living Single) and Dr. Joi Carr, academic director of Pepperdine University’s IEMC. Carter came up the industry ranks and established herself as a producer at Pearl Street Films, the motion picture company founded by Ben Affleck and Matt Damon. After serving as EP on the Affleck-directed Argo, Carter went on to launch Little Bricks Entertainment. She was driven to take what she learned at Pearl Street and apply it to her own company where she could “create stories” centered on people outside the mainstream. Affirming that “storytelling is about connection,” Carter equates stories to traveling where the experience opens you up to new voices, races, religions and cultures. “Seeing a different piece of life” is integral to growth, establishing empathy and community, said Carter. Farwell broke out from a prolific, fruitful relationship with Meyers to partner in Resonate Entertainment, a company committed to making “movies for and about, and marketed to women.” Diversity and inclusion both in terms of storylines and generating career opportunities are essential to “changing people’s hearts and minds” by “creating empathy,” said Farwell. Brown, Carter and Farwell all moved up the industry ladder over the years to attain their current status. Farwell, for example, started out at the William Morris Agency (now William Morris Endeavor). She referred to the talent agency as “a boot camp” where she could learn all about the business. Farwell harbored the ambition to work on a movie set. She saw on a job list the opportunity to be an assistant to Meyers who was about to direct her first feature, a remake of The Parent Trap. Farwell graduated to full-fledged producer, working on a high-profile Meyers filmography over the years. Carter meanwhile gained her initial industry footing in the corporate public relations division at Disney, focusing on its worldwide real estate holdings before dovetailing to the company’s entertainment business. She then wound up taking a gig on Project Greenlight, which connected her with Affleck and Damon who produced the HBO filmmaking competition show. This led to Carter becoming Affleck’s assistant. And when Affleck extended his creative reach to directing, Carter was afforded the opportunity to produce those films, including Argo, for which Affleck won the DGA Award. And Duly Noted’s Brown paid her dues in the production trenches, initially as a production assistant, moving up to coordinator, production manager, line producer and producer. She’s now a film and TV producer who thanks to her broad-based experience in the nuts and bolts of the business can confidently declare “nobody can tell me differently now” about how the industry functions. Brown has an intimate understanding of “how to build something from the ground up.” She experienced first hand how the biz works and ways to bring a creative vision to fruition. Another AFM panel, held Sunday (11/4), focused squarely on diversity. Titled "International Awakening: Investing in Gender Diversity for Expanding Audiences Around the Globe,” the session featured panelists Alison Thompson, co-president, Cornerstone Films; producer Janet Yang; Marguerite Pigot, VP, outreach and strategic initiatives for the Canadian Media Producers Association (CMPA), and Jonathan King, president of narrative film and TV, Participant Media. Moderating the discussion was Kirsten Schaffer, executive director of Women in Film, Los Angeles. AFM discussions ventured into assorted other areas beyond diversity and inclusion. An opening session on Friday (11/2), “The Global Perspective--View from the Top,” featured Jean Prewitt, president and CEO of the Independent Film & Television Alliance (IFTA), which produces the AFM; and Charles H. Rivkin, chairman and CEO, Motion Picture Association of America (MPAA). The AFM’s Pitch Conference panel on Saturday (11/3) brought together panelists Tobin Armbrust, president, worldwide production and acquisitions, Virgin Produced, and indie producer Cassian Elwes. Talk was moderated by Pilar Alessandra, instructor/consultant with On The Page. During AFM, the IFTA announced the results of its annual elections to select its board of directors. IFTA’s executive committee will continue to be headed by chairperson Michael Ryan (GFM Films), vice chairperson Andrew Kramer (Global Entertainment Strategies, Inc.), and vice chairperson/secretary Clay Epstein (Film Mode Entertainment). These executives join those currently serving the second year of their two-year term as IFTA board members, including Tannaz Anisi (13 Films), Paul Bales (The Asylum), Caroline Couret-Delegue (Film Seekers), Gabrielle Stewart (Hanway Films), Carl Clifton (Hyde Park International), Jason Buckley (Lakeshore Entertainment), Jeffrey Greenstein (Millennium Media, Inc.), Jeannine Tang (Participant Media), and Lise Romanoff (Vision Films, Inc.). Headquartered in Los Angeles, IFTA represents and provides significant entertainment industry services to more than 140 member companies worldwide consisting of independent production and distribution companies, sales agents, and financial institutions engaged in production finance. Collectively, IFTA members produce more than 400 independent films and assorted hours of television programming each year, generating more than $4.5 billion in distribution revenues annually.